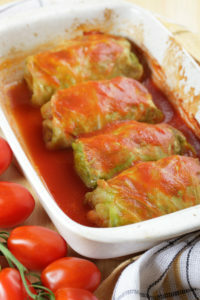 Cabbage Roll Casserole – Easier than doing cabbage rolls! In a large mixing bowl combine the onion, tomato sauce, cabbage, rice and salt. Add meat and mix all together. Pour mixture into a 9×13 inch baking dish. Stir, replace cover and bake for another 30 minutes.